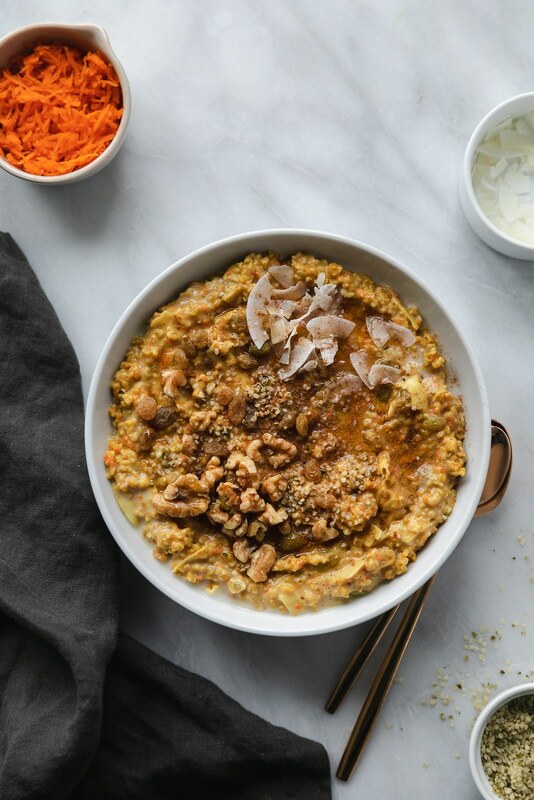 This Superfood Carrot Cake Oatmeal is the most perfect cozy breakfast! 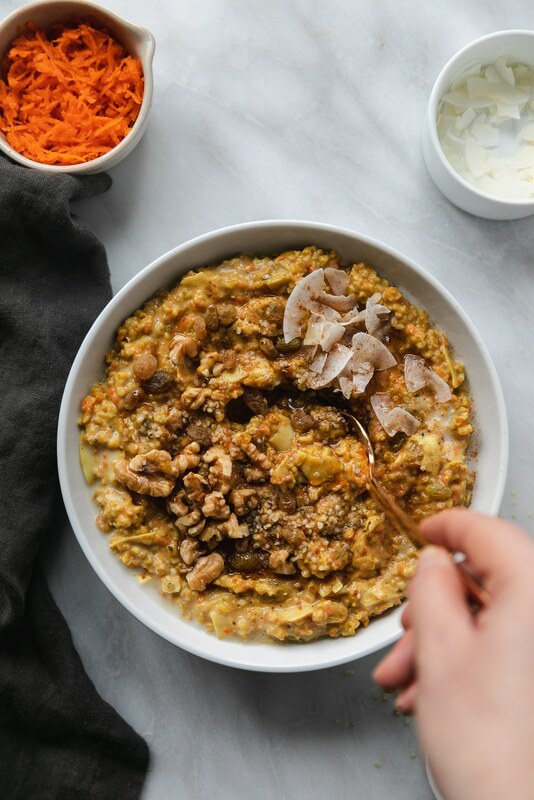 It’s filled with superfoods like turmeric, walnuts, coconut oil, and hemp seeds, (plus grated carrots for some veggies! ), so it’s incredibly good for you, and super comforting at the same time! 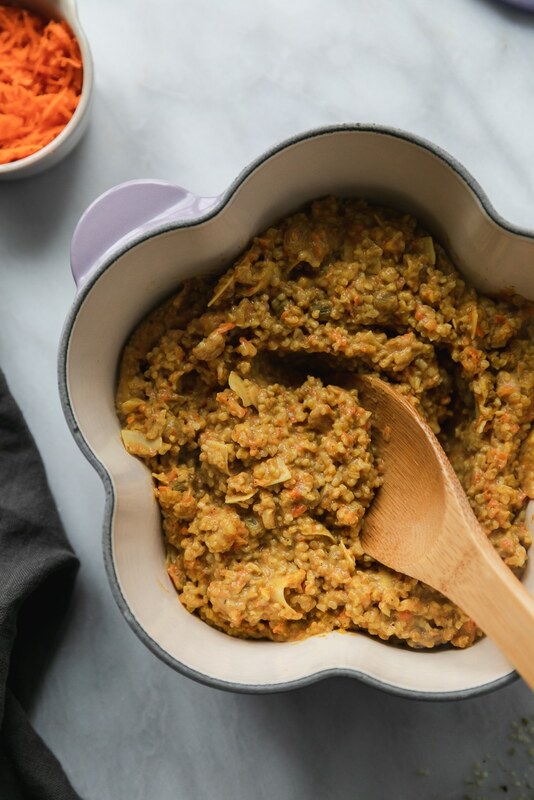 It literally tastes like carrot cake, and it’s an incredibly nutritious way to start your day! This month, it’s been realllly cold. We’ve been spoiled with mild weather for most of winter so far, up until a couple weeks ago, and I am so not ready for real winter. Hence, the desire to make a cozy, comforting, yet healthy breakfast for mornings when you just can’t seem to get out of bed. PLUS, it’s packed with everything good-for-you. There’s even vegetables in there! Awesome, right? You can make this days ahead of time, and heat it up the mornings you’re pressed for time! For me, that’s every morning. Problems of a girl who always needs to do everything. I can’t even stand how delicious it is! 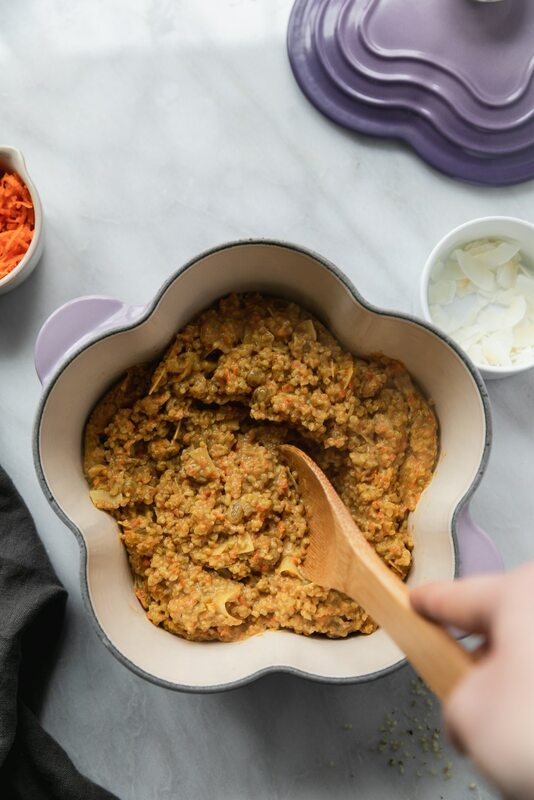 It’s like superfood carrot cake, and it’s just the coziest bowl of goodness. 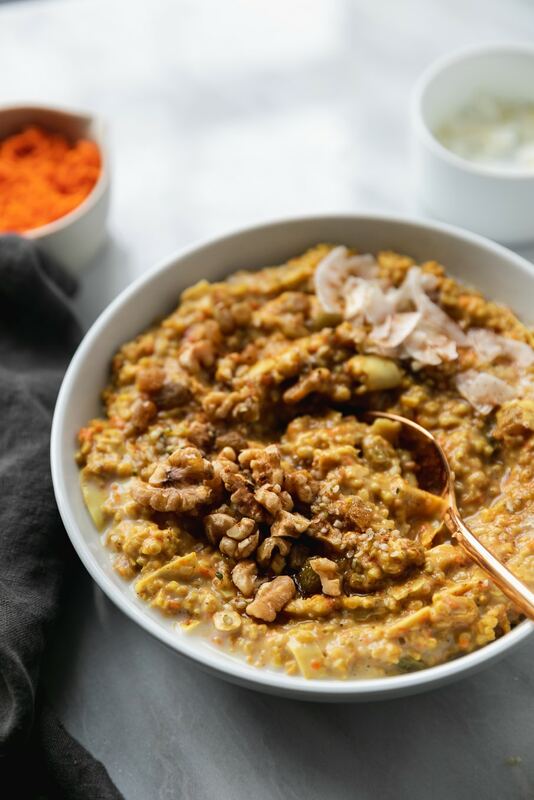 We’ve got steel cut oats, lots of grated carrots (don’t be weirded out by this – they literally melt into the oatmeal and give it such a perfect sweetness! ), turmeric, cinnamon, nutmeg (all the warming spices! 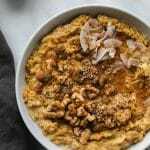 ), maple syrup for a little sweetness, coconut flakes, hemp hearts, walnuts, and golden raisins. SO freaking good and tons of texture! I think that’s a huge reason why I love it so much too. 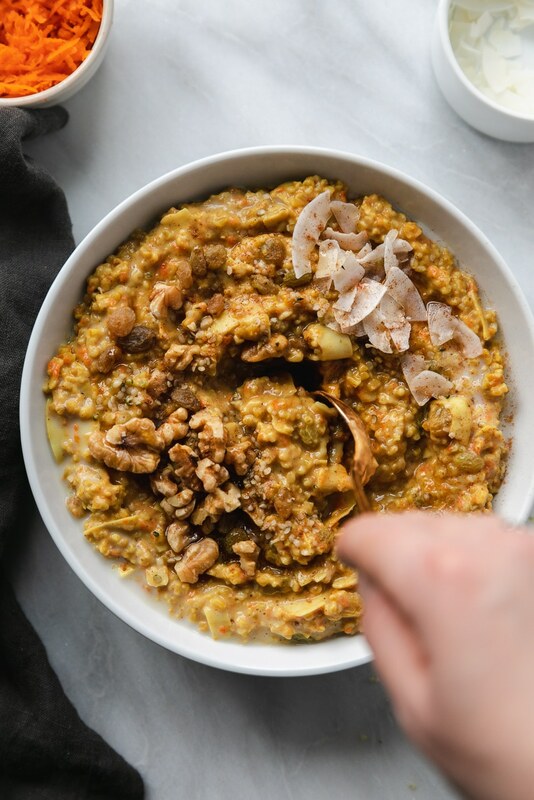 Steel cut oats take a little bit more time and love to make, but all you really have to do is stir it from time to time. 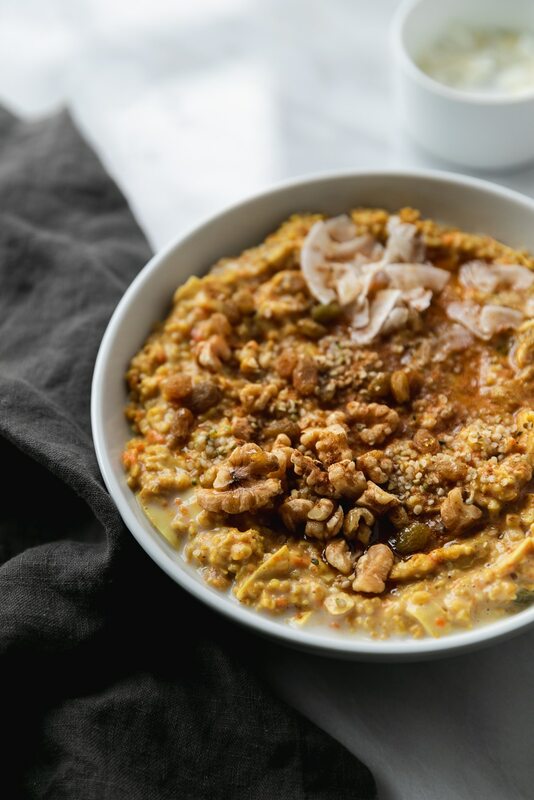 The oats take about 15-20 minutes to cook, and they get SO creamy. I make real oats more often just because they’re quicker, or overnight oats, but I really need to start making steel cut more often. They’re so darn good! They have a little bit of a bite/chew to them which I really love too. You can totally make these ahead of time too, and just reheat them with a little extra milk. Over the stove is the best, but you can totally just re-heat them in the microwave too. Having healthy breakfasts at-the-ready is so crucial for me, one, because I’m always starving when I get home from the gym, and two, because I’m most productive in the mornings, and I like to focus my energy on getting stuff done, instead of cooking breakfast and doing dishes. And three, because when I have days of cooking and photographing multiple recipes, the last thing I want to do is cook breakfast before I have to cook another four recipes that day, plus dinner. You know? This is one of those things I just want to pull out of the fridge, reheat, and go on with my day. It’s so perfect. I love to garnish it with chopped walnuts, coconut (the big flakes are the best! ), a sprinkle of hemp hearts (lots of good healthy fats and plant protein! ), golden raisins, a drizzle of really good quality maple syrup, and extra cinnamon. And sometimes and extra swish of milk too! I go back and forth – sometimes I like my oatmeal thinner and milkier, but sometimes I like it thicker! Totally a personal preference. A drizzle of full fat coconut milk or coconut cream would be AMAZING here too. Pretty much the only breakfast I need to get through this winter! 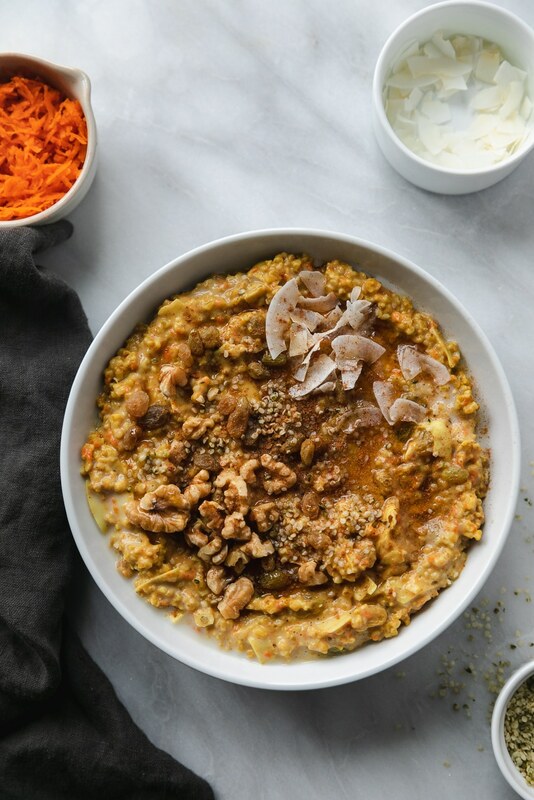 This Superfood Carrot Cake Oatmeal is the most perfect cozy breakfast! 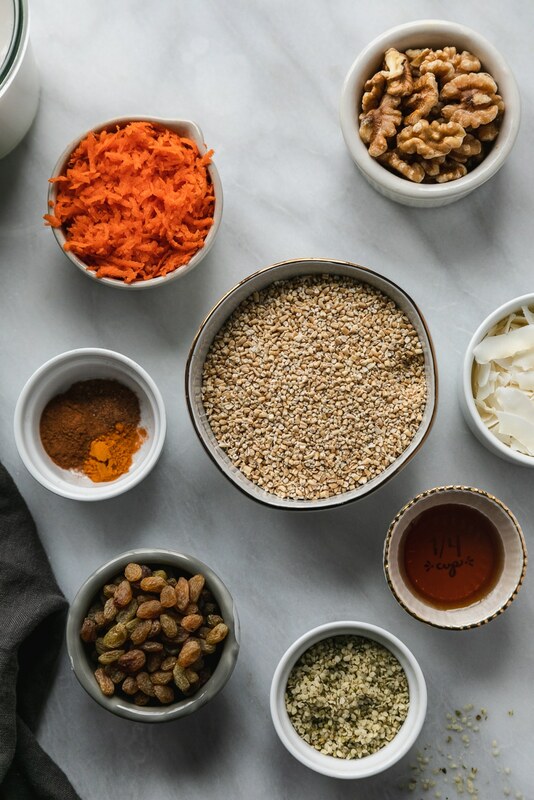 It's filled with superfoods like turmeric, walnuts, coconut oil, and hemp seeds, (plus grated carrots for some veggies! ), so it's incredibly good for you, and super comforting at the same time! 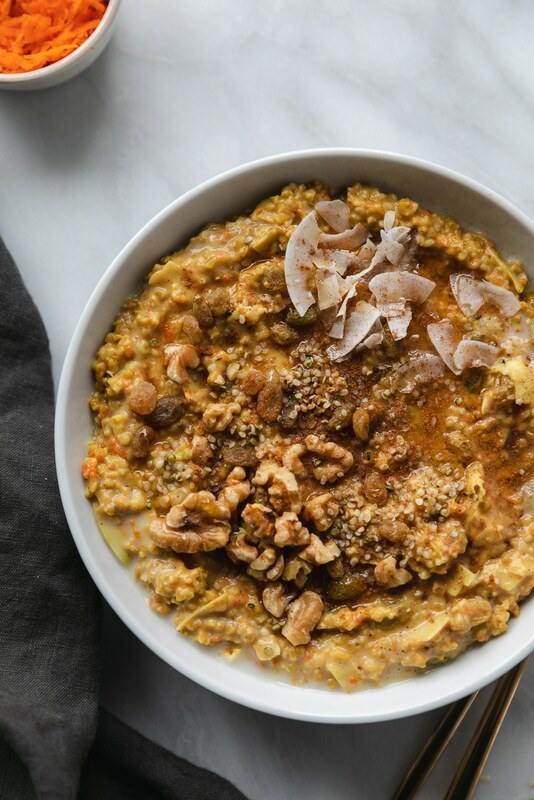 It literally tastes like carrot cake, and it's an incredibly nutritious way to start your day! 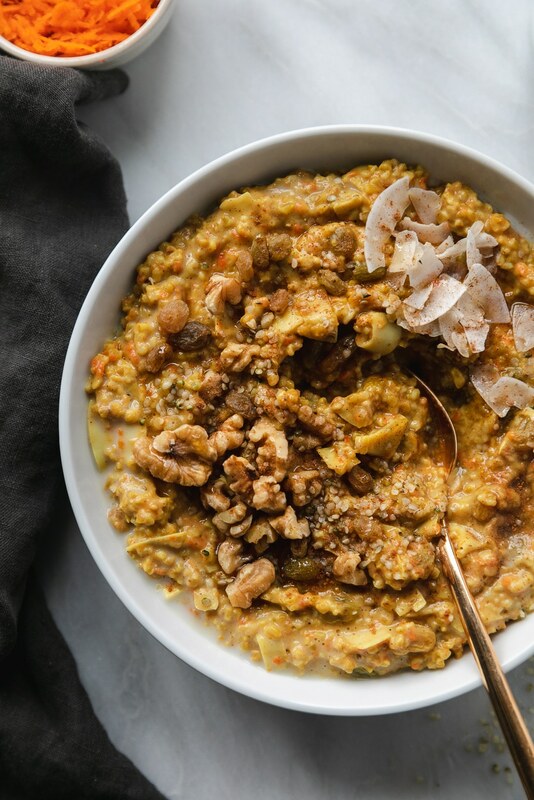 Combine almond milk, cinnamon, nutmeg, turmeric, a pinch of salt, coconut oil, vanilla, and maple syrup in a medium saucepan and bring to a boil. Once boiling, add oats and carrot and reduce to medium/low heat and cover. Simmer for 10 minutes, then add the coconut, raisins, and walnuts. 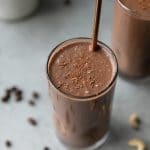 Cook for an additional 5 to 10 minutes, stirring frequently, until most the liquid is absorbed and oats are tender, cooked through, and creamy. 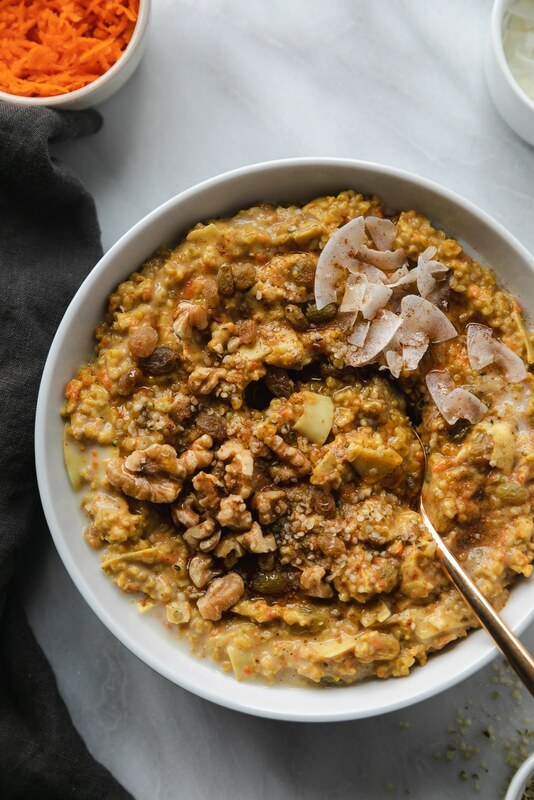 Portion into bowls and top with extra coconut, raisins, walnuts, a sprinkle of hemp hearts, a drizzle of maple syrup, and a sprinkle of cinnamon if desired. This post was originally published on 1/17/16, but was updated with new photos and text on 1/28/19! 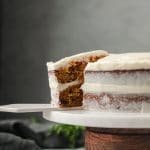 My Favorite Simple Carrot Cake + My 5 Year Blogiversary!